Learning about mugwort is simply epic. Once I feel that I have understood her, she shows me there is more to learn. She is a very nurturing plant ally. Also known as cronewort (and a thousand other names for that matter), this herb is legendary from Europe to Asia (and in parts of Africa). The only native species of mugwort in the US is Artemisia douglasiana (I believe), found out West. I found it easily in California when I lived there. It is easy to propagate as well and many other species have already been introduced to the US. Once it is propagated, it spreads through its rhizomes (not seeds) and creates a hearty stand of plants — growing to about 2-3 feet high, usually. Beware, this plant will take over your garden — so give it lots of room! Over the years I have noticed that this herb appears near doorways and entrances. Whether a small field of mugwort or just a few silvery sprigs of her — she is there, make sure to look! This led to sense that she was a portal, doorway, or transition herb. And, it turns out that Susan Weed says just that (I’ve just found out) — especially in terms of midwifery and the doorway of the birth canal. She can also be a doorway into the dreamworld, the imagination, or into journeying. Mugwort, the most common variety being Artemisia vulgaris (Artemisia for Greek goddess Artemis who is goddess of the moon and the hunt, this plant being one of her sacred plants), has many other species. This is a lunar herb; the silvery backsides of her leaves reflect this. Mugwort is an herb every woman wants to keep in her medicine chest. There are so many ways that mugwort has been used over the centuries and across cultures. I will go through the many ways of tapping into mugwort medicine later on in this blog. It’s also good to note one of it’s famous cousins — wormwood. This super bitter herb has been used to make the liquor absinthe for ages (she is also closely related to Chamomile and Sweet Annie). There is discrepancy on where ‘mug’ came from in the word mugwort (wort simply means plant or herb in Old English). I like the theory that it means ‘fly’ or ‘moth’, alluding to its use in pest control. However, Stephen Buhner says that mugwort translates to “beer herb.” And, in his amazing book “Sacred and Herbal Beers,” he talks about its uses as one of the three main beer brewing herbs before the German Beer Purity Law in 1516 (allowing only hops, barley, and water to be used in the brewing of beer). Buhner also talks about how this law finalized the crushing of the ancient ‘alewives,’ the largely female-led brewing of low-alcohol content brews that were both medicinal and nourishing. The German Beer Purity Law landed in the hollow footsteps of the Witch Burnings of the 13th-15th Centuries and participatd in the complete disempowerment of Europe’s women. 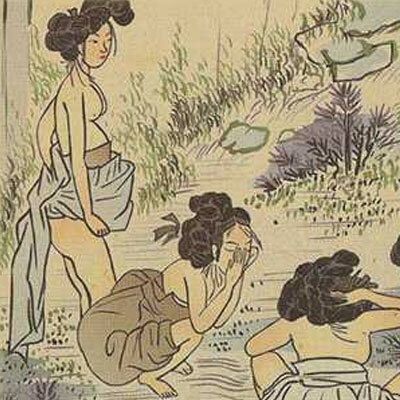 If your menses come on slowly and scantily, this herb is great for encouraging bleeding (emmenagogue). Actually, this herb is known to balance both heavy bleeding and scanty bleeding. Besides being a uterine tonic, this herb is a digestive bitter. It also has been used for colds, fevers, epilepsy, bronchitis, nerves, and joint pain. As a medicinal vinegar infusion, it is high in easy-to-absorb Calcium and other vitamins and minerals. Appropriatley so, you can dry bundles of mugwort and place them in drawers in your home to deter moth invasions into your woolly items and such. You can also make a tea infusion and apply the infusion to your skin (or spray) to keep bugs at bay. I have never tried this, so let me know how this goes for you. Also, this use of mugwort made me think…I wonder if it’s good to keep mugwort around annual plants (like tomatoes)? I wonder if it would deter garden pests. Anyone know or tried this? Being associated with the moon, mugwort is said to connect you with your dreams (allowing you to access more lucid, vivid dreams). If you dry a bundle of mugwort (wrap in string) and hang it by your bed or place under your pillow, Artemisia will do her work. She is known to help you clear your dreams if they are disturbing as well. I remember I suggested this to participants at a retreat I was in some years ago. Everyone seemed to invoke dreamtime and I got a lot of really positive feedback from folks putting a bundle of mugwort under their pillow. It is common to find mugwort in a mix of other dried herbs for smoking. Some other common herbs to mix with it would be lavender, yerba santa, white sage, mullein, spearmint, and peppermint. Of course, as smoking can singe the delicate lung hairs (or cilia), one puff every now and then is all you need to move the chi in your lungs. One day, I picked a bunch of mugwort. With half, I made sage bundles for smudging (I also added some sage). With the other half, I let it dry to make tea. I had never had mugwort tea, but I thought it would be good to try right before I was due to menstruate. So, a couple days before my cycle, I boiled some water, steeped the leaves and took a sip — YUCK! It turns out that artemisia douglasiana (native to CA) is what I picked and it is VERY BITTER to drink. Don’t try it… However, after being in Western NC for awhile…I’ve gotten to know artemisia vulgaris and the tea is light and delicious. In Traditional Chinese Medicine (TCM) they use dried mugwort to make the moxa sticks. They basically light one end and blow out the flame until there is a nice, hot ember at the end. The heat from the stick is used to move chi in the body. I use the moxa stick mostly for the first day of my cycle, when I have cramps. I move it in a clockwise circle from just under my navel to the base of my belly; I continue to move it in a circle (just above the skin) until my cramps have passed. There is a smoking and a non-smoking stick that you can buy. I would suggest the non-smoking because your room or house will be very smokey and the powerful smell of mugwort (although sweet and comforting) will take over your place (and your clothes). had been carried down from generation to generation. yet to be recognized by all sections of the community. For those of you out West who tend to the trails, mugwort could come in handy for you. 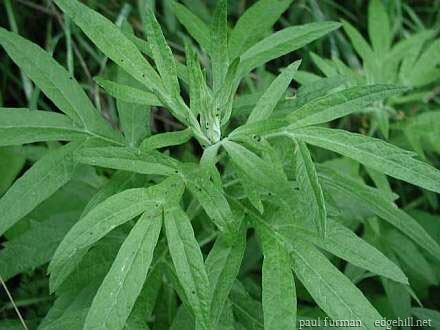 A mugwort poultice is soothing to the skin when having an outbreak. Also, you can bruise some mugwort leaves right after being exposed to poison oak and cross your fingers that the strong oils of mugwort eliminated the poison oak oils from your skin. >I just got here from the link in your post on the permaculture yahoo group. Very interesting blog and I love this entry on mugwort. I have had one in my backyard for about 2 years, but it does not spread as much as I would like it to – I really like this plant. I'll be back to explore some more. Wish I could get involved in the sanctuary, but I live in San Francisco! Artemesia douglasiana is a powerful medicinal used by Chumash, Tongva and other native people. You take ONE leaf, plus ONE leaf of white sage (dried fresh, no matter) put in cold water over a very low fire until you see steam rising (do not boil), pour off the infusion into your cup, let it cool a bit and drink it. Best right before bedtime, daily. It tastes very good until you don’t need it any more, then it becomes unpleasant. What do you think? Your help is much appreciated! Well that *does* look like mugwort… Does it have a “silvery” underside? Taste just a little ~ it should be bitter and quite aromatic. Ok then, look up Artemisia douglasiana ~ it may be that species ~ enjoy!